A double CD release, featuring two June 1975 shows from multi-track tape. 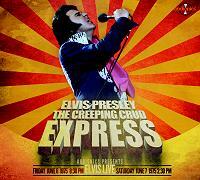 The Dallas show has been out numerous times, first as an official release on Elvis Aron Presley. The Shreveport show from the day after is new however! Not long time ago Follow That Dream released the evening show from Shreveport on Another Saturday Night. Here comes the afternoon show from the same day, previously unreleased. The sound quality is magnificent! The Dallas show is comparable to Dallas SeventyFive, but perhaps slightly less high fidelity?